『유가사지론』은 유가파의 기본적인 논저로 인도의 미륵보살이 지은 글을 당나라의 현장이 번역하여 천자문의 순서대로 100권을 수록한 것이다. 이 책은 고려 고종 33년(1246)에 대장도감에서 간행한 재조본 고려대장경 판본 가운데 하나로 전체 100권 가운데 권64이다. 닥종이에 찍은 목판본으로 형태는 두루마리처럼 말아서 보관할 수 있도록 되어있고, 세로 36.8㎝, 가로 49㎝ 크기를 26장 이어붙였다. 재조대장경은 전해지고 있는 판본이 다양하지만, 인쇄가 정교하고 종이의 질이 두텁게 뜬 닥나무 종이이면서 표지와 제목이 원형 그대로 남아있는 것은 보기 드문 예이다. 인쇄 상태가 선명하고 정교한 것으로 보아 13세기부터 14세기 사이에 찍어낸 것으로 추정된다. 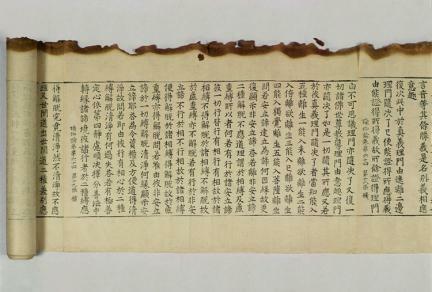 As the principal text of the Yogacara school of Buddhism, the Yogacarabhumi Sastra (Discourse on the Stages of Yogic Practice) was authored by Maitreya-nātha of India and translated into Chinese by Xuanzang of the Tang Dynasty. 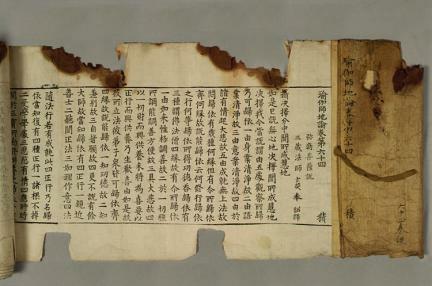 The original book was published in 1246 (33rd year of the reign of King Gojong of the Goryeo Dynasty) as part of the Second Tripitaka Koreana. 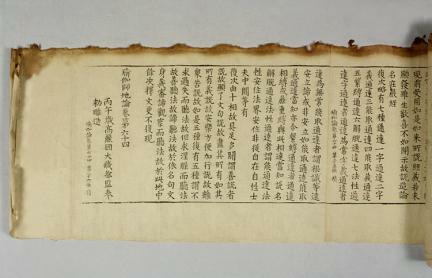 It was printed on mulberry paper, with 26 pages (49 cm wide and 36.8 cm long) pieced together to form a scroll. This book is estimated to have been printed between the 13th and 14th centuries because it was clearly printed with an elaborate technique. It is a rare example of books whose covers and types remain intact.